In this and following posts, I’ll be discussing the construction of 3 different chests found in Scandinavia. I have chosen these 3 similar chests because of both their similarity and their differences. The Mästermyr chest is the most sophisticated in construction, and has the most complete and secure lock. The Oseberg chest (No. 178) is the simplest construction, and has surviving hinges and a lock-plate. The Haithabu (Hedeby) chest is a blend of the two other chests, and is a convenient sized to reproduce at full size. It’s also decorated with incised lines, so it looks spiffy. The best documented and studied of the three is the Mästermyr chest found in 1936 in Snoder, Sproge on the isle of Gotland in Sweden. It was pulled out of a field by a farmer while plowing, and preserved by a local historian. Details of the chest and related finds are described in Arwidsson and Berg’s The Mästermyr Find (1983). The date the chest was buried or abandoned is very hard to determine, as there are “few datable features” of either the chest or the tools [Arwidsson, 37]. The best guess, based on some of the tools included in the chest, is that the chest is from the “Viking age,” a time period from 793 to 1066. Although the chest was found full of tools, it’s doubtful it was originally a tool-chest. It had been damaged before it was abandoned, so it may have been re-purposed. The size and shape of the chest make it unwieldy to carry many heavy items. Based on the thickness of the boards, and the sophistication of the lock, it was probably designed to carry something more valuable than iron tools. The chest is rectangular with a lid curved in cross section and a flat bottom. The bottom is joined to the ends by mortise and tenon joints. The chest is held together by wooden pegs at the ends and sides. The ends and sides are trapezoid and therefore slope inwards at a slight angle. The ends, which are made of a slightly thicker scantling than the sides and bottom, have a rectangular mortise about 4 cm from the lower edge for the tenons of the bottom plank. The lower portion of each end thus forms a raised base.The ends, sides, bottom and lid each seem to have been made from a single piece of wood. The underside of the lid is hollowed out, leaving an oval, trough-like depression. On either side of the depression the underside of the lid is flat, where the original thickness of the plank has been preserved; this provides a good fit against the upper edges of the end planks.the sides are pegged to the ends and the bottom and the bottom is joined by mortise and tenon to the ends; a rectangular tenon at each end of the bottom plank fits into a mortise in the ends. The details of the construction can best be seen in the illustrations.The wood seems less carefully dressed on the inside than on the outside. However, it is difficult to comment on the details of the finish or on any surface treatment of the wood because of its poor condition….Chest: sides 86.0-88.5 x 20.5 x 1.8 cm and 87.5-89.5 x 20.9 x 1.8 cm; ends 22.4-26.2 x 1.8-2.5 x 24.2 cm and 21.5-26.3 x 23.8 x 1.8-2.7 cm; lid 88.5 x 24.0 x 3.2 cm. The Hedeby sea-chest on display in the museum. The chest is composed of six oaken parts, with a slightly curved lid and inclined side panels (Crumlin-Pedersen 1997, p. 141 f; Roesdahl 2003, p. 225 f). It measures 52 cm in length and 23 cm in width and has a height of 27 cm. The longitudinal panels are inserted into notches in the sides. The floorboard is mortised into the side panels and was also nailed up onto the long sides’ lower edges. The vertical parts are decorated with a double line engraving [Kalmring, 282]. The original lock had been broken out of the wood, and a large rock was found in the chest. This has led Kalmring to suppose that the chest was sunk after the contents were stolen. It was also suggested that the shape of the chest made it suitable for an oarsman’s bench. The only issue I have with this interpretation is the height of the chest (23 cm or just over 9 inches) makes it much too short to sit on comfortably. 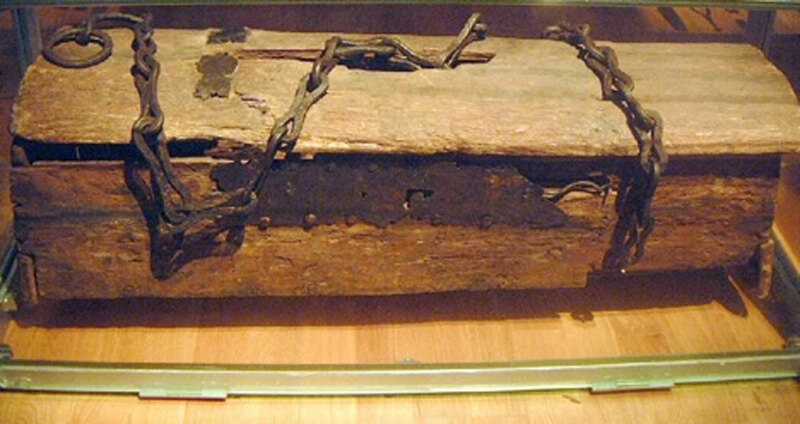 The third chest was discovered in the Oseberg burial mound at Tønsberg (100 Km southwest of Oslo, Norway) during excavations in 1904 to 1905. The interment of the ship in the mound dates from AD 834, but many of the goods were dated to earlier than this. A detailed archeological report (Osebergfundet) was produced in 1917 to 1928, but no further editions were ever published, so information on the construction details of the chest are hard to come by. Fortunately, http://www.unimus.no now hosts many of the conservation drawings and photographs of the artifacts from the Oseberg find. There were 3 nearly complete chests found. Chest 149 was the largest, and bound in iron strips. Chest 156 is similar to 149, but only the ends and one side were found. Chest 178 was mostly intact, with hinges and the hasp and lock plate still attached. I chose 178 to re-produce due to the simplicity of the construction, and the pleasing proportions. Chest 178, p. 121-124 is similarly of oak but without mountings on the sides (fig. 68). The bottom, all the sides, and the lid are preserved, the latter, however, being somewhat damaged. Its construction about the same as the two foregoing [Chests 149 and 156]. The length at the upper edge is 62 cm, at the bottom 66.3 cm. The width of the side pieces is 24 cm at the bottom and, originally, 21 cm at the top. The height is 31 cm. Two iron hinges have been mounted in the centre of the back longitudinal side. These consist of simple iron clasps made of slender, flat, iron rods. In front, about the centre of the upper edge, an elongated four-sided mounting of sheet iron has served for a lock. The lock spring, which was of iron, was fixed in a narrow opening. A stopper which is now missing, belonging to the spring, was fixed just inside the keyhole. When it was required t open the chest the key was placed in the keyhole and the stopper forced aside. The spring was thus free to turn through the passage and to follow the lid when lifted. Next post: what tools do you need to build these chests?